Every carpenter knows that miter saw stand is a vital equipment but unfortunately very expensive. But since necessity leads to innovation, DIY enthusiasts have learned how to build their own miter saw stands. Do you want to know how to construct a miter saw stand plans? Now, it is very easy if only you have an ultimate plan to do so. Besides, why should you spend a fortune buying a ready-made miter saw stand yet you can make your own? Our article will be focusing on an easy, straightforward and cheap method to construct miter saw stand that works. Moreover, this article will show you step by step method of construction a reliable miter saw stands that are even more versatile than those you will find in shops. As you may have noted, a miter saw table aids in supporting longboards and has a fence that you can fit with obstacles or stops to allow you make identical cuts. Now, it simply works by locking your saw when you are working. It features built-in cubby holes that provide an ideal place for storing those small parts that are vital for any carpentry project. This equipment also allows you to leave the saw on board while you slide the whole unit into a truck for outdoor or on the road projects. Further, the miter saw stand or table offers a perfect workbench where you can do a lot more than just cutting tasks. It offers a nice platform where you do those small carpentry tasks. In short, a miter saw stand, plays a role in almost any part of a carpentry project. The design we will be focusing at will work for any type of miter saw. It is a customizable design to fit any saw you need. For the tools, you’ll just need to cut the plywood into the required lengths using the miter saw, then use dividers and screw the whole work together. Here is the procedure for making a miter saw workstation or stand. In this step, you are supposed to measure the height of the saws deck. The reason for this is that the height of the Outfeed and the indeed should be equivalent to a depth of the saw deck. Now, you should use a marking gauge for added accuracy, instead of using a tape measure. Using this tool, you are supposed to measure starting from the top of the saw deck down to the surface. Also, using a small combination square will allow you to maintain the accuracy and precision until you change it. This is the second and a very important step in any miter saw workstation design. Now, you are supposed to mark out the various pieces of the project on the plywood sheet. Actually one piece of?’’ Birchwood will provide all the wood material you’ll need for the whole project. You should mark the two sides, two top pieces, and four panels will all come from the provided plywood sheet. After all the 8 pairs have been cut, there is likely to have some small left out pieces. Don’t throw them away since you use them to make the feet of the saw and others applications. The measures required are; 9 inches wide by 8 feet long, 9 inches by 16 inches for the box ends. For the top cuts, use the remaining wood. 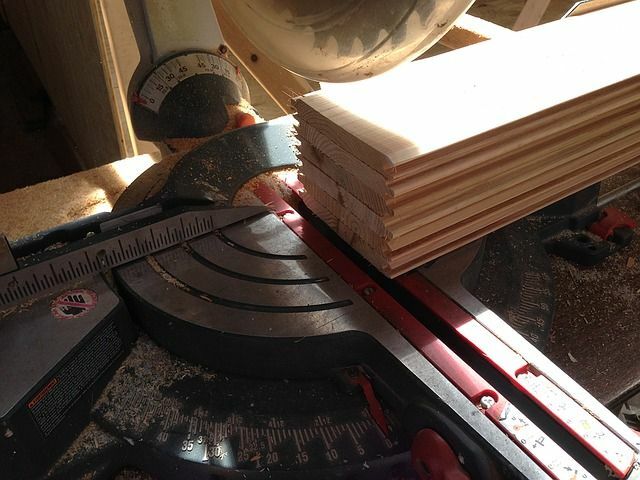 Now, a shoot wood can be ideal for guiding the circular-saw through the long cuts. This is the third step and a vital step in ensuring you get the best workstation for your miter saw. First, mark out the notches for the side panels. Now, by using a combination square, mark the depth of the notch. Having done that, the width of the notch is the width of the swing of the saw’s level, with additional 6 inches. You are supposed to set the table saw fence to an ideal length, and once again using the same combination square, measure from the teeth of the saw blade. Now place the first side piece on the table and do inverted plunges cut to start the notch. For crosscuts, use a circular saw. Now, do the same for the second side piece. You should do this procedure on a large and flat surface. Then, set two side pieces upright making sure the box ends are between them. After that’s screw gussets on the corner to help keep the miter square. Then screw the corners together flush and then remove the gussets and finally put the top piece. Make sure you put a top on each box. This is the last step in our miter saw stand plan or workstation. Now in this final step, you are supposed to construct two skids using the leftovers of the plywood. Basically, a skid comprises of two pieces whereby there are a top and a bottom. You should chamfer the bottom skid so as to fit sides of the boxes easily. Ensure that the walls of the boxes are?’’. Use one piece of the?’’ plywood and measure the end of the chamfered skid. Lastly, screw the saw to the skids. A miter saw is a functional carpentry tool. For sure since its invention, it has revolutionized the way of doing things. You can now make sophisticated and breathtaking designs just because the miter saw provides you what you want. However, the saw can’t be used on its own and has to be on a foundation known as a workstation, stand or table. But miter saw stands are quite expensive for small-scale business, it is true it an expensive equipment if you choose to buy the factory made models. We have already shown you how to construct a miter saw table or stand, and there is no need to incur unnecessary cost any more. We just gave you the best miters saw stand plan.